The Clyde Valley Stompers were formed in 1952 in Glasgow, Scotland. 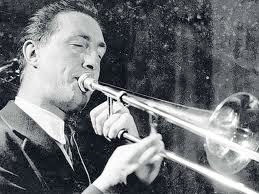 The amateur trad jazz group quickly found a following at the Astra Ballroom in Glasgow and when band leader Jim McHarg (bass) emigrated to Canada two years later he was replaced by trombone player, Ian Menzies (1932 - 2001). Soon after the band became a full-time professional group. During the 50s, the moldy figs like Chris Barber, Humphrey Lyttleton, Acker Bilk and Kenny Ball became popular and the Clyde Valley Stompers extended their popularity beyond Scotland and released several records on the Beltona label. Essentially they were a live act and the recordings never quite caught their energy subsequently their records did not sell especially well beyond their loyal following. The band members included, successively, Charlie Gall and Malcolm Higgins (trumpet), Jimmy Doherty, Forrie Cairns and Peter Kerr (clarinet). The rhythm section included pianists John Doherty, John Cairns and Ronnie Duff, banjo players Norrie Brown and Jim Douglas, bass players Louis Reddie, Andrew Bennie and Bill Bain, and drummers Bobby Shannon, Robbie Winter, Sandy Malcolm and Billy Law; and vocalists Mary McGowan, Jeannie Lamb and Fionna "Fiona" Duncan. Dubbed ''the most travelled jazz band in Europe,'' they appeared in village halls and big venues alike and even topped the bill at Liverpool’s Cavern. As their popularity grew internationally the band moved to London, and signed for Pye Records. There they were managed by Lonnie Donegan and toured with him as well as other top names including Louis Armstrong, Shirley Bassey, Petula Clark and blues legend Big Bill Broonzy. Sometimes the band were billed at the Clyde Valley Stompers and others as Ian Menzies and the Clyde Valley Stompers. “Stompermania” predated the Mersey Sound but had all the same intensity. The Clyde Valley Stompers were the first trad jazz band to appear on the Royal Variety Performance, when it was held in Glasgow Empire. Their popularity in the UK was enhanced with guest appearances on television's Morecambe & Wise, Russ Conway, and Thank Your Lucky Stars shows. In 1963 the band appeared in a British musical called It's All Happening (The Dream Maker) and starring Tommy Steele..
As the fad for Trad Jazz passed the group disbanded in 1963. Over the decades the band has occasionally re-formed to perform as The Clyde Valley Stompers Reunion Band which included Jim McHarg.